The Handic 008 a crystal scanner that can be modified easily to monitor your favourite paging frequency. By equipping the scanner with the right crystal, it can be tuned to your local paging frequency. 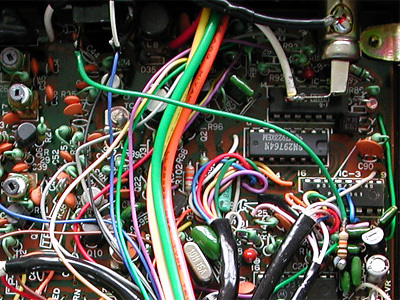 The discriminator IC is half hidden under the multitude of wires in the scanner. 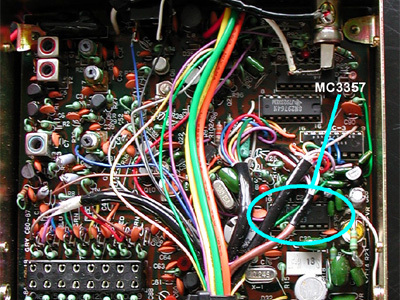 Next to pin 9 of the MC3357, a test point can be found. This test point is connected directly with pin 9 of the IC. 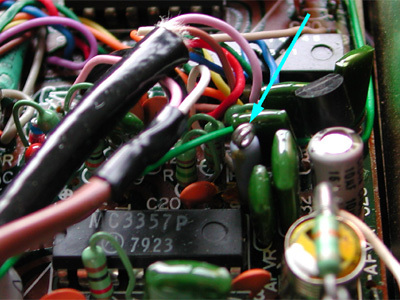 A 10 k resistor is connected with the test point's solder eye. A short lead of wire connects the resistor's other lead with a 3.5 mm chassis terminal in the back of the scanner. You can use a separate chassis connector or, if you don't want to drill, reuse the existing earphone connector. In that case, the two wires running to the connector have to be taken off and connected directly. One of these wires runs to the loudspeaker.